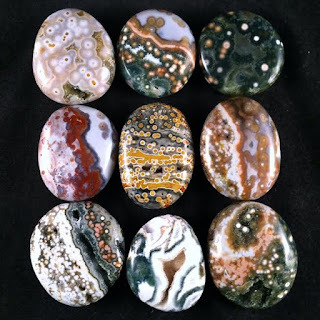 Every time I see Ocean Jasper, I'm amazed at the colors and patterns. 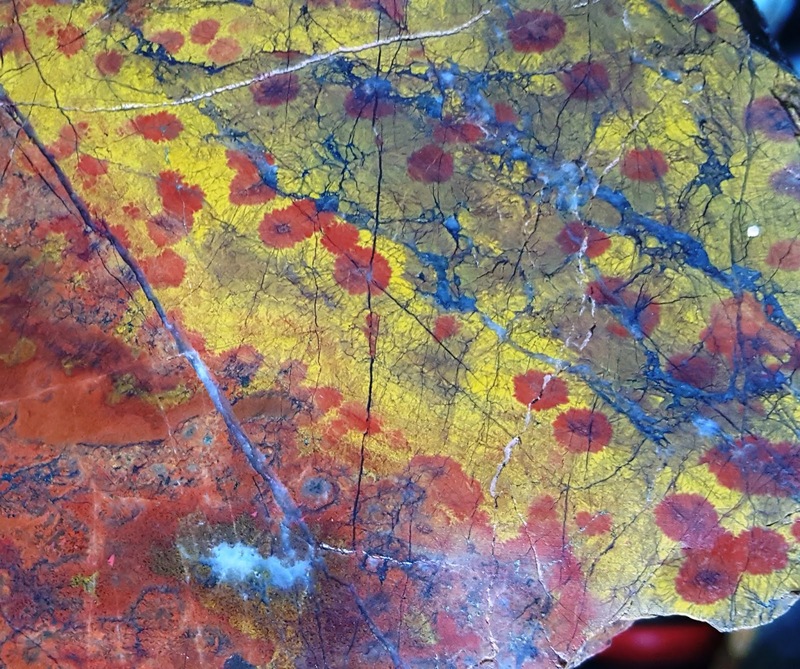 I became very curious about this delightful lapidary material. Thinking it was so well-known in the lapidary world that there would be a wealth of information available from a variety of sources (mindat.org, you disappointed me). I found myself doing my initial research at Enter the Earth. 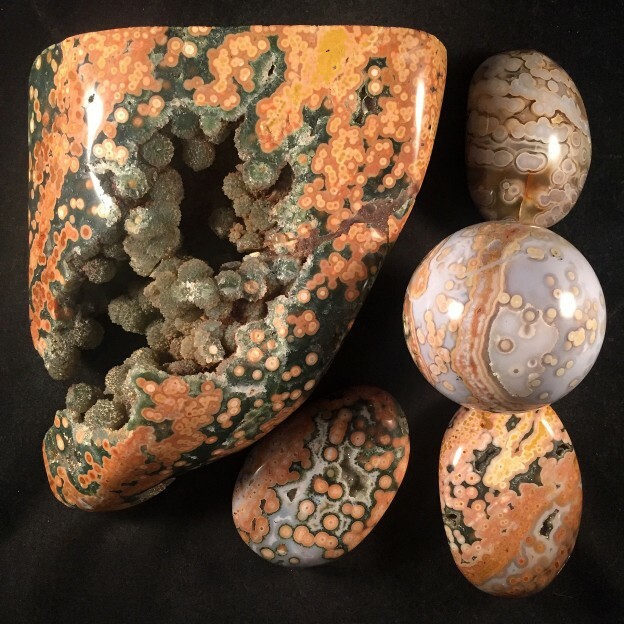 The first thing I learned is that rather than being a general description of a multi-colored stone that typically features spheres and may include banding and/or druzy, Ocean Jasper® is a registered trademark owned by the Gem Shop. FUN FACT: This material that is only found on the Northwestern side of the Island of Madagascar, which, at 228,900 square miles, low off the eastern shore of southern Africa. It is the world's fourth-largest island. Many of us know of as the supplier of 80% of the world's natural vanilla. Ocean Jasper is not mined from the ocean, but close. 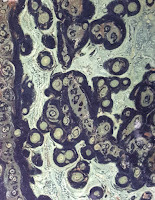 Paul Obeniche had seen references to the material in a 1977 photo of Kabamby Ocean Jasper which was included in Grund’s Encyclopédie des Minéraux (French, “Encyclopedia of Minerals”). Years later when a prospector brought him samples, Obeniche set out to prospect for it himself. He found it in October 1999 in northwestern Madagascar when low tide made the veins visible. The material was underground and as prospecting advanced, each additional vein has been found further inland. 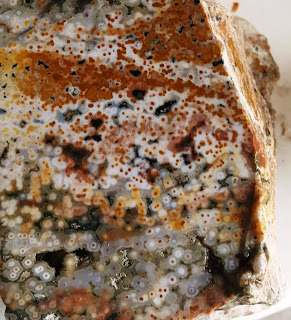 When you find Ocean Jasper at a show or online, it came from Enter the Earth which owns the mines. Obeniche, who discovered the deposits, mentored Nadar Kawar who now owns the mine. FUN FACT: It was first introduced to rockhounds and lapidary artists at the Tucson Show in 2000. When asked about the availability of the material, Chris Matthews, spokesperson for Enter the Earth, says, "We never know how much Ocean Jasper is going to be available. Some years there is none. For example, we had no new rough from 2006-2013. The vast majority of what is found is lower quality, with little to no color and patterning. Since we only import the "A" and "B" quality rough and polished materials, Ocean Jasper may be limited, even when being actively mined. Speaking for lapidaries everywhere, I hope they find an endless vein of the best stuff this year! "While we have not found anything large enough to be called another "vein", we have hit a few larger pockets of rough since 2014. The most recent one is very dark green, with light yellow and white banding, and the previous one was more muted, mostly blueish green, yellowish green, and gray." They continue to search for more veins and pockets. There are many kinds of orbicular jasper in the world, but the trademarked Ocean Jasper is found only in Madagascar. Kambaba jasper, green and dark, is also found in Madagascar, but it is not Ocean Jasper. 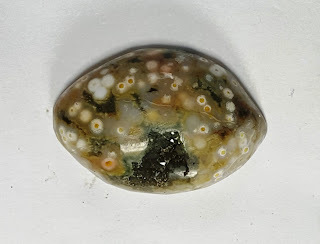 Other orbicular jaspers I've seen have been distinctly different enough to easily differentiate them from the Ocean Jasper material such as this piece of Morgan Hill Poppy Jasper. While my experience with Ocean Jasper is somewhat limited, I love this material. In addition to telling stories with its orbs and patterns, it has two of my favorite characteristics: it is stable and contains druzy-lined vugs. I bet that you, like me, have worked with material that contains orbs of one sort or another and found that when you were busy trying to craft a shape and polish it, that many of the little orbs were busy jumping ship, leaving you with small, spherical holes. Not the look you were hoping for. I haven't had this problem with Ocean Jasper. As your Lapidary Whisperer, you know I'm always looking for the story in the stone. Druzy-lined vugs are perfect for giving a cabochon character. 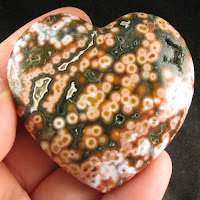 For example, this is one of my Ocean Jasper cabs. I absolutely love the shiny dark green druzy that lurks like a hidden forest in this Ocean Jasper cab I made. I've found that the pieces and slabs of this jasper take a very nice shine, always a good thing in my book! Depending on the vendor you shop with, Ocean Jasper can be a bit dear, but it's absolutely worth it. It's for sale at the Enter the Earth site, some other vendors and at shows. I've mostly seen it priced by the slab or by the pound (when I see prices by the gram, it tends to scare me away). Next time, let's talk about carnelian, the mineral named after a fruit!